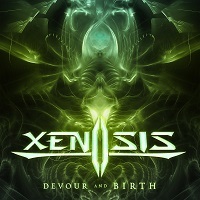 Progressive/Technical Death Metal quintet XENOSIS formed in New Haven, Connecticut, USA, in 2010. Their first release was a self-titled EP in 2010. Since then, they have released two full-length albums, in 2012 and 2015 respectively. In 2018, they now present their latest offering, “Devour and Birth,” which contains eight tracks. “Night Hag” leads off the album, with some punchy and heavy guitar riffs, and dancing bass guitar lines. The Death Metal vocals vary in delivery, from low and guttural to higher pitched utterances. The sound is dissonant for the most part, favoring technicality over melody. But there are strings of melody that run throughout, especially from the lead guitar breaks. “Army of Darkness” is little shorter but no less intense. The kick drum rolls like the galloping hooves of rebel troops on a war path. The lead guitar work is again responsible for much of the melody, and is played with dexterity and a trained ear for music. “Delirium (Death of a God)” has discordant chord patterns and a steep of methodological rhythms, pushing some meter shifts and overall diversity moving forward. It is very tightly executed, like a machine programmed to perform a specific task that it can do a million times in a row, without the slightest of variation. “Concave” has industrial sounding riffs, charged with aggression and dropping bombs from the sky as they hit each passing bar. The sterility is noteworthy and really makes for what you might call “thinking man’s Death Metal.” It is pulverizing and void of warmth. The one minute interlude, “Oxidation,” is like something from another planet. It bubbles with electronic effects, and undiscernible spoken word, leading sharply to “Ominous Opus,” which starts off slowly and with utterly low and rich Death vocals that rattle your very being. Guitars and bass work in unison to produce a punishing set of riffs, and an overall harrowing sound. The structure of the rhythms are like watching the mysterious crafting of an alien vessel. The end product is like nothing you have seen before, and the crafting seems to have come from a mad scientist with means that seemed unhuman. This is a meticulously crafted track that does not follow conventions. “Devour and Birth” hits the ground running, with a quickened pace and rhythmic accents at every turn. The Progressive nature of the album is really strong in this track, with more changes than you can keep up with, complete with a sprinkling of cowbell and a shredding lead guitar solo. “The Projector” closes the album. The fat guitar riffs leave a lasting impact and various different grooves that linger just long enough for you to assimilate them before shifting to another passage altogether. With all the skill and industrial mastery of a band like GOJIRA, “Devour and Birth” is a fascinating and fiercely oppressing plate of Technical and Progressive Death Metal that produces rhythms akin to advanced mathematical algorithms. For a self- produced album, the production is great as well; clear and free of defect. If you like your Death Metal with intelligent songwriting, this is for you.